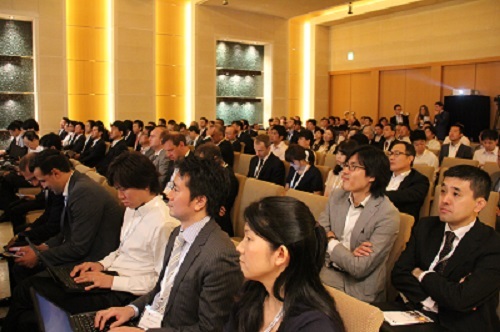 As the Forex Magnates Tokyo Summit drew to a close this evening, delegates could reflect on a day of senior level dialog among the industry’s key professionals having focused on the FX and binary options industry’s largest market. The Mandarin Oriental Hotel in Japan’s capital city today hosted 700 executives from all aspects of the industry, and were party to panel discussions, networking and to conclude the day’s events, the Forex Magnates Award Ceremony, presented by Forex Magnates founder and CEO, Michael Greenberg. In November last year, Mr. Greenberg presented the Award Ceremony at the Forex Magnates London Summit, in which ten Western firms were nominated for a series of awards, based on a vote by a panel of judges. This evening’s Award Ceremony in Tokyo provided a benchmark by which Japanese companies can be viewed internationally, and also a platform by which Japanese firms can make their strengths known outside of their home country. Japan, being such a truly vast market for FX and binary options, hosts a very well established domestic FX industry in which a degree of firms operate solely within the country and generate substantial volume, whilst offering their clients a high level of knowledge and a quality trading environment. This year’s awards encompass twelve categories, whereby each firm was subject to assessment on a number of criteria and demonstrates Japan’s robustness and experience in FX to participants in the rest of the world. The Award Ceremony concluded the 700-strong event, and gave way to an evening of relaxed conversation and further ability for attendees to socialize and enjoy the Open Bar event at the Mandarin Oriental Hotel. Forex Magnates would like to extend appreciation to all who attended the Tokyo Summit, and wishes you a safe journey home. We look forward to meeting you all again at the Forex Magnates London Summit at the Grange St Pauls Hotel in November this year. Ironic to see SBI get the best spreads award. They indeed had the tightest spreads… But last week they announced to customers that they were being forced to widen them out due to liquidity issues, as I understood it. But then 0.10 on USD/JPY did seem to be ridiculous and too good to last.